The concept I have postulated is more an intellectual exercise with theoretical validity, aimed to give a codified structure to what is often attempted in contemporary orchestral/operatic/fusion/film forays with "a Carnatic base". My postulate also offers a mathematical extension to such forays since many new combinations can be tried more systematically by futuristic composers interested in venturing into this territory. Carnatic music, renowned globally as much for its exciting aesthetics as for its scientific and precise approach, made tremendous strides both theoretically and practically after the 72 parent-raga (melakarta) system was postulated and developed several hundred years ago by Govinda Dikshitar, Venkatamakhin and others. Prominent classical composers including the Tyagaraja, Muttuswami Dikshitar, Oottukkadu Venkata Kavi and others embraced the system and created attractive pieces which bestowed musical immortality upon this already brilliant concept, which is one of the greatest musical strides ever taken by man. Though a couple of extensions have been proposed in recent times to the grand 72 mela system, only the 36 dvi-madhyama melas (using both varieties of Ma instead of Pa) by Tanjore S Kalyanaraman briefly made it to the stage since the proponent was a noted performer and composer who created pieces in each of the 36 scales. A bhashanga raga is one that uses notes not native to the scale. Since foreign notes is an automatic disqualification for a raga to be considered a parent raga (mela) like the 72, I have not used the term mela for what I proposed on 3 Sept, 2013 (as per my notes). I merely called them sampoorna bhashanga ragas. This is a system of 188 ragas which use one or a maximum of two foreign notes in ascent or descent (Arohana/Avarohana) or in both. In some ways, this merely extends the vivadi concept already seen in 40 ragas out of the 72 mela system. In a manner of speaking, these 40 are also bhashanga since they use 2 varieties of R/G/D/N but vocalise it as a sharp 2nd/6th (Ri/Da) or as a double flat of the 3rd/7th (Ga and Ni). Again the 72 have only 7 notes. The sampoorna bhashanga raga system introduces foreign notes to these 72 which means that it will have 8 or 9 notes. To understand and codify it easily, let us divide the notes into two tetra chords SRGM and PDNS. A maximum of one foreign note is introduced in each tetra chord. 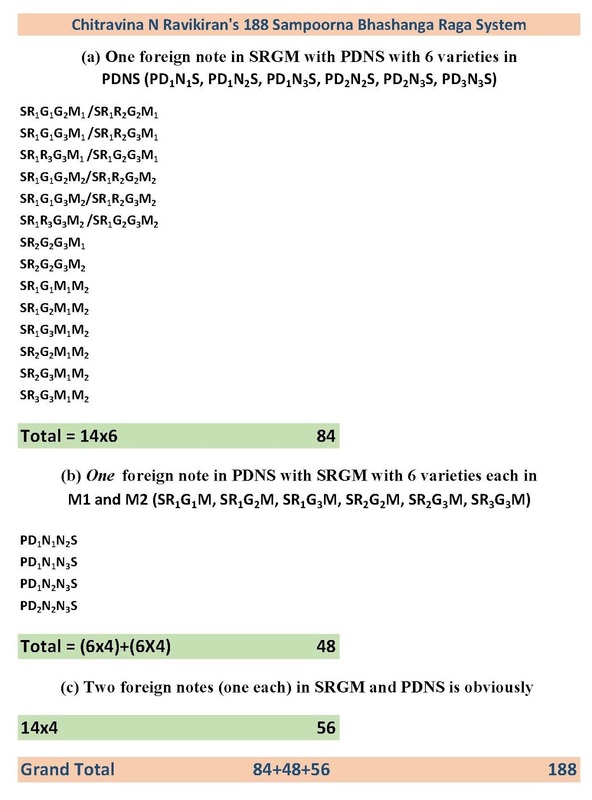 This means that a raga can have one foreign note in either SRGM or PDNS or in both SRGM and PDNS, allowing it a maximum of two foreign notes in all. Anything more than one foreign note per tetra chord will make it even more boring and weird! The foreign note can occur in either ascent (arohanam) or descent (avarohanam) or both. The 188 ragas I have proposed do not have any zig-zag (vakra) phrases like say, Bhairavi - which uses SGRGM. This is not intended so much to extend Carnatic frontiers, which I firmly believe has tremendous beauty and scope as is. The calculation: I have only given below the broad classification here. Please see image file for details. 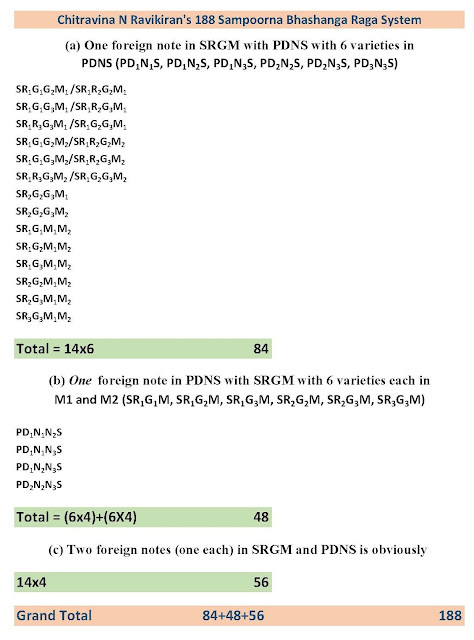 (a) One foreign note in SRGM with PDNS having usual 6 varieties = 14x6 = 84. To reiterate, most of these are no more than melodic formulas. They will not fit in with core Carnatic aesthetics. Of these, probably a handful could be interesting in Carnatic-Hindustani jugalbandhis since the latter system is much more liberal about foreign notes (perhaps not surprising since it was deeply impacted by foreign (Persian) concepts for several centuries since the 1300s). It would also be appropriate to clarify that the 188 sampoorna bhashanga raga system is in no way related to my concept of melharmony whose primary spirit is to project melodic-harmonic systems' existing and established values and aesthetics rather than extending them. PS: I thank Mr Ram Athreya for pointing out a calculation redundancy in my original list.